This week I have been working on old projects and starting a new one. I have tons of wool, especially scrap wool, so I plan on using the wool that is not great for hooking or appliqué and making scrap rugs. I was gifted wool, years ago and decided to start with that and making a braided rug. 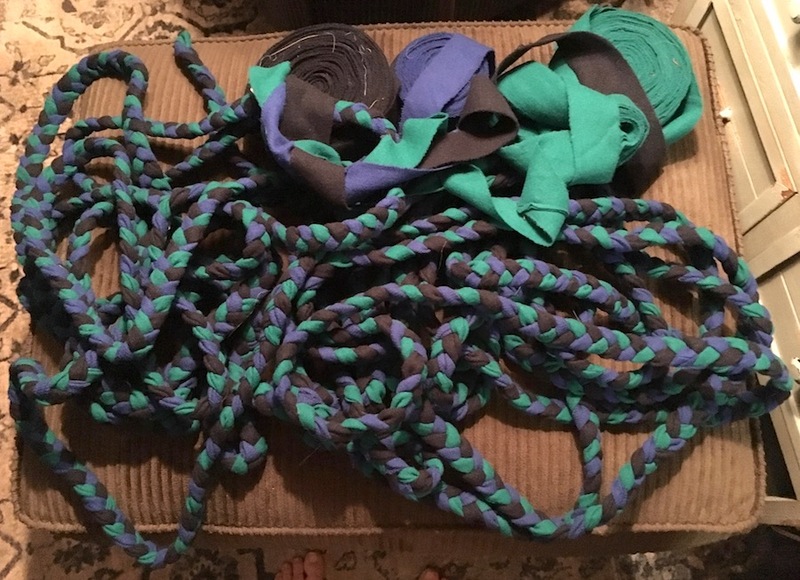 The great thing about braided rugs are, they are not hard to make and you do not need any tools, if you use what you have. There are various methods so it is a great way to use up junk wool and fabric scraps, as well. I couldn't find my braid aids, but I did find an old set that was still in the box and it even came with a measuring tool and flat needle for threading. I get old supplies from friends and relatives, so sometimes I don't even realize what I have. It is a nice set and never been used, so I can use it for future rugs. For this one, the strips are too thin to get a nice braid with them. This is what I have gotten done so far, a bit thinner than I like, but I have enough rolled strips to make a small throw rug, so once I use up this wool, I will finish it off and if I need a little extra, I know I have plenty of similar wools. I am using my hands to turn the wool under, as I go, so slower going. It also twists as I braid, so I have to untwist it, as I go, so that slows me down, but also gives my hands a rest. While I was looking for the aids, I found items I had forgotten about. To finish and paint the floral rug, or sell to someone else. The cats would be a fun one for the kitty bowls. And, it is one rug the cats won't claw at. The dog piece is another oldy, I really need to clean out my supplies, lots from the 80's. And we got to spend time at the beach on the weekend and a few days during the week. 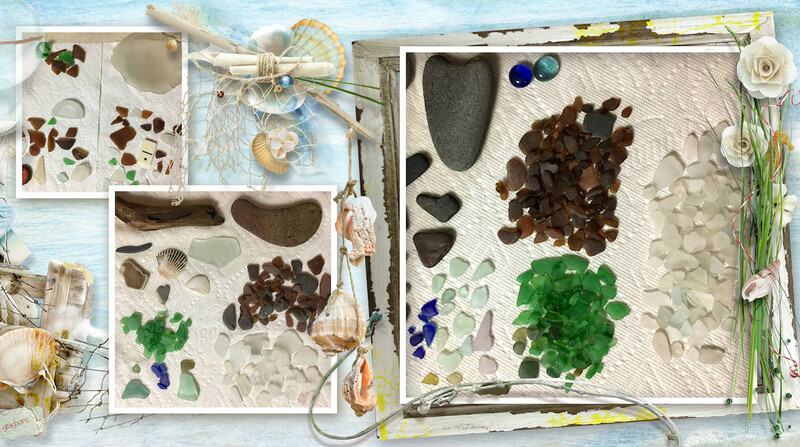 The glass photos to the right are from my favorite beach, we found some nice treasures. The smaller photo on the left is from a local port beach, not a lot of great glass, but a few fun finds, a domino and an old local beer cap. Now I need to make time for working on some art pieces I have been thinking about. I've never braided a rug before but Lord knows I've enough wool to make one big enough for all the homes in my neighborhood. Am looking forward to seeing it all finished. I grew up with braided rugs everywhere and there were so durable. 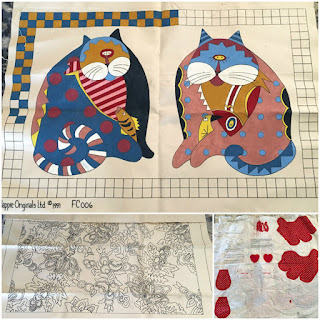 I'm not sure I have the patience to make one, but I'm sure yours will be gorgeous. Those cats are so, so cute! I remember braided rugs from when I was a kid. I've never made one since I crochet my rugs - braiding might be easier on my hands so I should give it a try at the cabin this summer. I like the colours you've used for this rug. Many years ago my mom made a braided rug and it was my job to stitch it togethet...lasted many years of use. I have never made a braided rug. I don't even know how to start. I love braided rugs - both from a practical sense and the look of them as well. My quilt friend just showed up at my door ... driven here by her husband ... bringing another box and bag of fabric and tools. I think a braided rug might be a good plan for some of these donated fabrics. Thanks for the idea. My mother also made a braided rug. I remember that it had turquoise in it. Your cat mats will be really cute. Have a fun week! I am still amazed at the amount of beach glass you always find.